This package has one sole dependency: node-openzwave-shared. This is a fork of node-openzwave that links to OpenZWave as a shared library, therefore you need to have the OpenZWave library installed in your system beforehand, using the operating system's package manager, or by compiling OpenZWave yourself. Its more than probable that you have included battery-powered ZWave nodes in your installation. When you include battery devices (using the 'addNode()' method), OpenZWave needs to persist their configuration to a file, otherwise all metadata about them (make and model, available command classes etc) will be lost when you restart node. Therefore you need to tell OpenZWave to write out the known facts about the ZWave nodes into a XML file. You can do that by using writeConfig() to store that XML file whenever you add/edit/remove nodes. Initialising OpenZWave 1.4.79 binary addon for Node.JS. is initialising the UserPath to be the user settings directory for NodeRed. The value for userDir can be overridden in the settings.js file used by Node-Red. This is a config node whose job is to hold the necessary data for initializing OpenZWave and act as the encapsulator for access to the OpenZWave API. 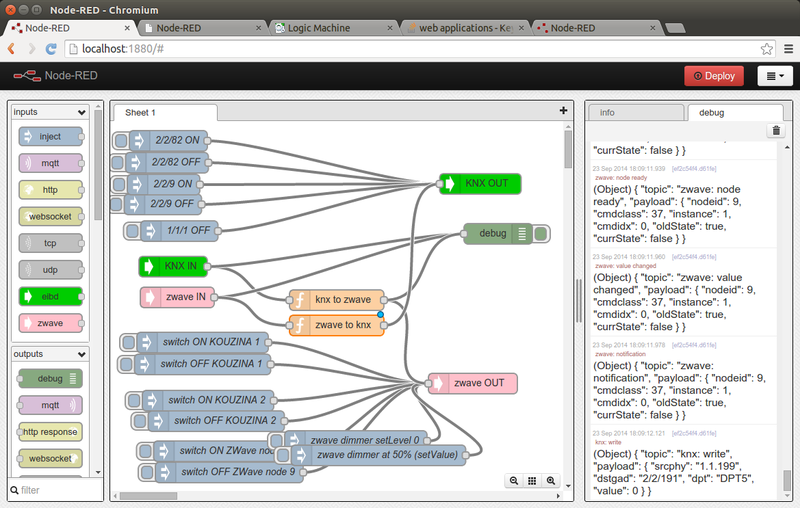 When you add a 'zwave-in' or 'zwave-out' into your flows, a singleton instance of this node is created in the background, and you need to click on the 'controller' icon, in order to configure where your ZWave USB controller is connected to (for example /dev/ttyUSB0 in Linux) and define a logging level. Click here for a full list of ZWave command classes. Important note: You should wait for a message with topic of scan complete when booting up your flow, before you start sending commands to ZWave, otherwise your commands will be ignored. You can invoke the full OpenZWave::Manager API, as long as the command is supported by openzwave-shared (see this source file for a list of supported commands). You should also consult the official OpenZWave::Manager class documentation. topic: set to the OpenZWave::Manager method name (eg. healNetwork). Method names are the same as in the official API, except the first letter is in lower case. payload: an array of the command arguments in the correct order. Most of the API calls in OpenZWave are asynchronous. This means that you don't get an immediate result value from the call itself, but you'll get notifications from their activity on the zwave-in input node. However, there are some direct API calls which do return a value (eg the getNodeStatistics is returning an object populated with the node's statistics: number of packets sent/received, transmission error counts etc). In this case, the result is appended to the message payload and forwarded to the output of the ZWave-out node. This is the only message that the zwave-out node is emitting.